SEOUL: The South Korean football association (KFA) said Thursday it had rejected an offer by the national team coach, Hong Myung-Bo, to resign following a disappointing showing at the World Cup in Brazil. "We've decided to continue to trust and support coach Hong," KFA vice president Huh Jung-Moo told reporters in Seoul. He added that Hong would see out the remainder of his contract which runs through the 2015 Asian Cup tournament. The coach and his players were criticised by the South Korean public and media for failing to advance beyond the group stage in Brazil, managing just a draw with Russia and then two losses to Algeria and Belgium. When the team returned home, angry fans unfurled a banner at the airport saying "Korean Soccer is Dead" while others pelted the players with toffees – a particular insult in South Korea. Huh acknowledged the frustration but argued that replacing Hong, who had offered to step down, was "not the best solution". "We expect him to lead our national team for the Asian Cup based on the experiences and lessons he learned during the World Cup," Huh said. Hong, 45, was a star defender and captain of the national squad during the 2002 World Cup when South Korea reached the semifinal. 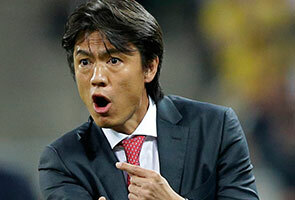 He only took over as coach in June last year after the resignation of Choi Kang-Hee, and his team selection in Brazil became a subject of heated criticism, particularly his decision to stick with striker Park Chu-Young who failed to score. Final Piala Suzuki AFF: Siapa 10 paling segak atas padang malam ini?